A.C.M.E 3 Updates – showDOLLS, Bushiroad, and more! Tags: ACME, Event, Ume-sama BANZAI!!! Breaking news from A.C.M.E! 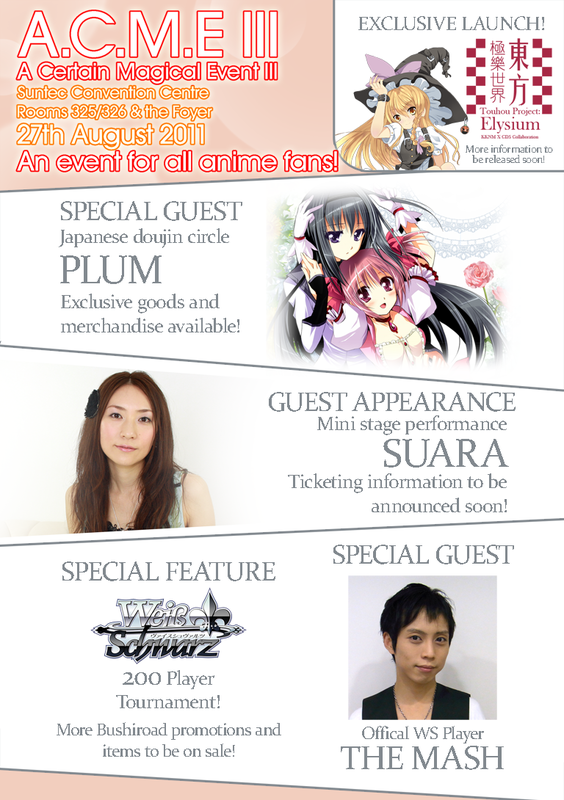 Details on the Bushiroad tournament and doujin artist lineup have been released! Click on the jump for more. Remember – ACME is on the 27th of August! The AKB48 OFFICIAL CAFE is now open! If you have been following the news around the local anime blog scene, you would know that top Japan idol girl group, AKB48, has been performing here in Singapore on a regular basis, and that there have been plans for an “official AKB48 themed cafe” to be opened here. Well, I am glad to say that the cafe is now officially open. The moral of the story? Even in death, “Saruman of Many Colors” never fails to have the last laugh. All we need now is Wormtongue appearing and Rick’Rolling everyone. A Certain Magical Event 3! A Certain Magical Event, or more affectionately known as A.C.M.E, is back again for its 3rd year running! And this year’s A.C.M.E promises to be far more exciting and enjoyable than ever before! Just take a look at the flyer below. More info after the break.